Proudly display all of your favorite soccer players on this colorful & attractive Soccer Personalized T-Shirts. 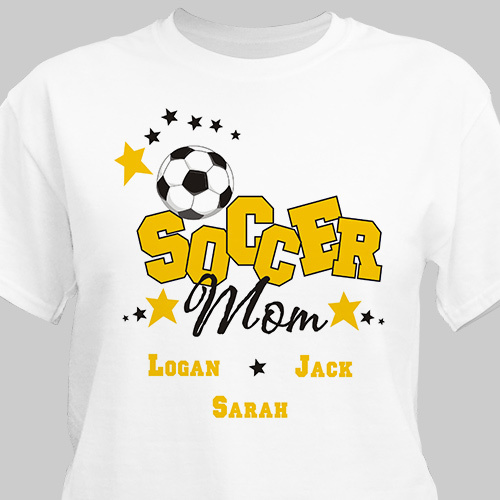 Soccer Mom shirt is Available on our premium white 100% cotton Personalized Shirt, machine washable in adult sizes S-3XL. Soccer parent gifts include FREE personalization! 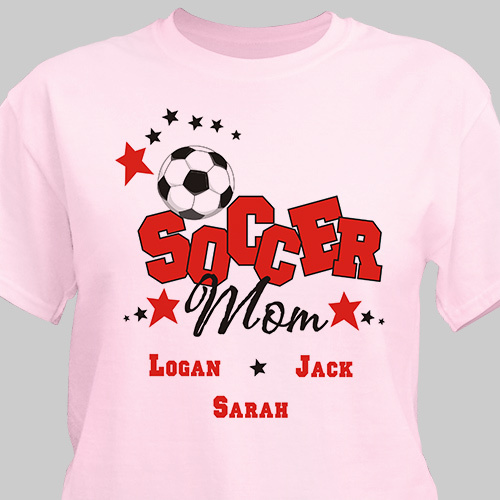 Our Personalized Soccer Mom Shirt can be personalized with any title: Mom, Dad, Coach, or any Soccer fan and up to 30 soccer players names. Further customize you soccer mom shirt with your choice of 10 print colors. my daughter in law was very happy to receive this for Mothers day. For the Soccer fan in your family we have many Personalized Soccer Gifts including Personalized Soccer shirts, Personalized Soccer Mugs & Personalized Soccer Hats.